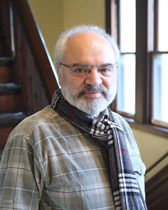 Hamid Naficy is a leading authority in cultural studies of diaspora, exile, and postcolonial cinemas and media, and of Iranian and Middle Eastern cinemas and media. His areas of research and teaching include these topics as well as documentary and ethnographic cinemas. He has published nearly a dozen books (some award-winning) and scores of book chapters and journal articles. In addition, he has lectured widely nationally and international and his works have been cited and reprinted extensively and translated into many languages. Naficy has also produced many educational films and experimental videos and participated in major international film festivals, curated film series, and initiated the annual Iranian film festivals in Los Angeles in 1990 and in Houston in 1992. Hamid Naficy, "Branch-Campus Initiatives to Train Media-Makers and Journalists: Northwestern University's Branch Campus in Doha, Qatar." in The Education of the Filmmaking in Africa, the Middle East, and the Americas, ed. Metter Hjort. (London: Palgrave, 2013), 81-98.